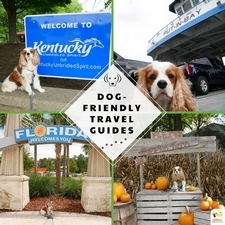 Dexter The Dog and I have always wanted to take a dog-friendly vacation in Vermont. 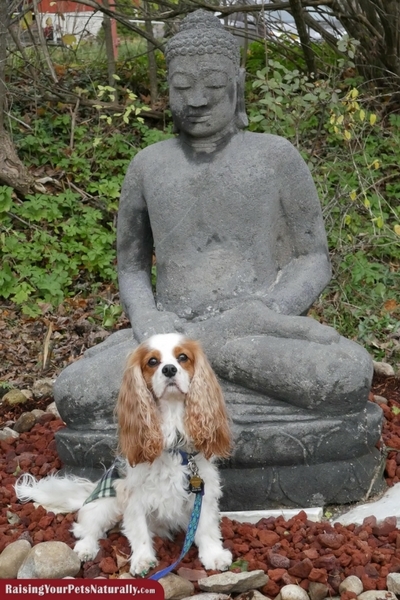 In October 2016, we finally had our chance, and traveled with another cavalier friend, Levi, and his Mom, Chris. Not only were we planning a lot of dog-friendly day-trips in Vermont, we also planned on chilling out in our dog-friendly Inn, the Wilburton Inn to be exact. 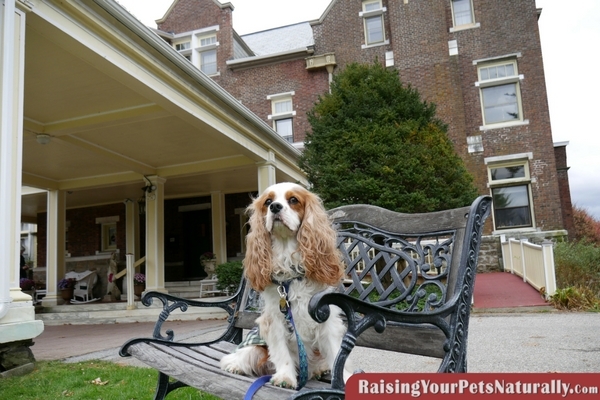 And yes, the Inn owners also have a cavalier named Jet! Our drive from Ohio to Vermont was a bit stressful, as we drove in with a wintery mix. That’s not the way I like to travel, but it is what it is. We finally arrived late at night and drove up the windy scenic road to the Inn’s check in. The innkeeper was very friendly and provided us with check-in instructions for our villa. We stayed in The Strawberry Inn Villa on the first floor. The villa can be rented either in its entirety or by up to six separate guests, which is what we did. The Wilburton Inn was named one of the top eight elegant US Mansion hotels by CNN, so I was a little concerned that it would be too fancy for us. But I was pleasantly surprised at how homey the room felt. Our accommodation included two wooden queen beds on the ground floor with a large en suite bathroom with a shower and tub. The room also had a couple of sitting chairs, TV, and mini fridge. This was perfect for holding Dexter’s home-cooked meals. The Strawberry Villa also included a large shared kitchen and dining space that we did not utilize. There was also a nice outside sitting area that we also did not use. 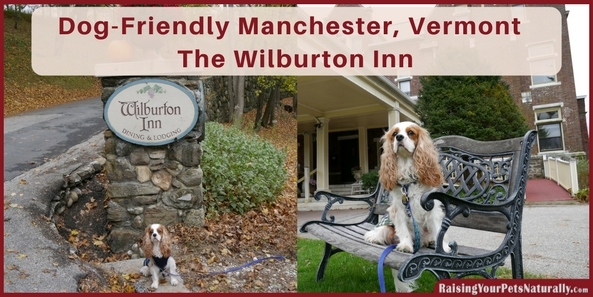 Although we spent most of our dog-friendly Vermont vacation touring the area, we did spend some time at the Wilburton Inn for a few fun adventures. First, a little history on the Wilburton Inn’s inspiring tale. In the early 1900s, the Wilburton was the largest gentleman’s farm in town. The current innkeeper’s eldest son, Oliver, and his wife Bonnie, continue this tradition. They grow organic heirloom produce along with baking artisanal hearth breads and, from what I hear, famous veggie burgers. They are well-known throughout New England and beyond for their high-quality organic foods. The Wilburton Inn offers rental houses, villas, and mansions throughout their thirty-acre hillside. These historic Vermont rentals feature dramatic mountain views. As we walked around the grounds, we enjoyed the artwork and sculptures throughout our walk. They also have a museum and workshops throughout the year. The Wilburton Inn also proudly grows botanicals, including herbs. Obviously, after a winter storm, we weren’t able to enjoy this firsthand. Another fun feature is that lead gardener Daba Kydner also provides private herbal consultations. I just may need to take another trip to Vermont in the spring. If you are looking for a dog-friendly vacation rental in Manchester, Vermont, I encourage you to check out the Wilburton Inn. Tell them that Dexter The Dog sent you! Have you been to Vermont with your dog? Tell me in the comments. I’ve not traveled with Magic, although he’d probably love the idea. He thinks the car belongs to him! I hope Magic gets to go on a road trip. It’s my favorite thing to do with Dexter. This looks like such a nice place to visit. I’m glad it’s dog-friendly and that you’re able to enjoy it with Dexter and Levi and Chris! Thanks. It was such a great trip. And good company! Sounds like you had a lovely time at the Wilburton Inn! We would love to travel to Vermont one day. 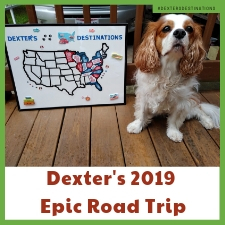 If we ever get there, we will be sure to check the Wilburton Inn out and tell them Dexter sent us! Beautiful photos. In general, New England is extremely dog friendly. We haven’t been up to VT in a few years, but might have to think about a trip! Thanks. This was our first New England trip. I hope not our last! I see that Dexter enjoyed the sights, good thing he’s so photogenic. I think it’s wonderful there are more and more dog friendly hotels and activities. A few months ago we had to stop in a hotel with the dogs, something we’d never done before. There was nothing welcoming about it other than the fact the dogs could sleep there. It served it’s purpose, certainly nowhere near as nice as your stay. We’ve stayed in hotels like that. 😐 But, now we try to focus on more dog-friendly accommodations. I’m glad you are adventuring out more with your dog. It’s so much fun! I sure hope you and Layla can travel together. It’s such a nice memory. Tht does look a rather nice place. We always wanted to visit Vermont, it sounds high up and isn’t it snowy in winter and this looks a perfect place! Our American georgraphys needs sharpening up! We know!!! I have never been to Manchester, Vermont but it looks like a lovely place! We drove from Cleveland to Killington a few times to ski and I remember that’s a long drive! How sweet that you made this trip with Dexter. I LOVE doing road trips with the dogs although with all three sometimes staying over is chaotic! I didn’t know you were in Cleveland! We’re only a few hours away. Yes, road trips with Dexter is my favorite thing to do. Hi, Sonja. What patios? At the Wilburton? They are dog-friendly the entire year. It looks like a wonderful place to visit! We’ve been to Vermont a few times, but either rented a home or camped during the summer. It is a beautiful state. It is a great state for sure! Camping, you are brave. I haven’t done that since a child. A lot of Canadians love Vermont for skiing and in summer. I sometimes do road trips but have not been to Manchester. The Inn looks lovely and even better you can take your dog. Kilo still has quite a few issues- I don’t think he would handle travel well. Eventually, I’d love to take him south in winter but we’ll see. Oh, no. I’m sorry Kilo. I wrote an article on car sickness and also getting your dog comfortable in the car. Maybe it would help. 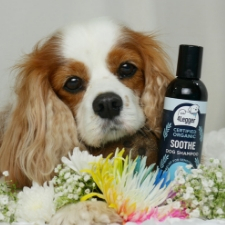 https://raisingyourpetsnaturally.com/dog-car-sickness We love the South too! Looks like Dexter had a great time! We love the Vermont area – and it looks like you all had a ball! We need to see more photos, will check on Instagram too! I’ve always wanted to travel to Vermont and New England. This looks like a lovely location. I wish I’d worked with the girls on traveling when they were younger so they could go with me. I hear you. Me too with the kitties. It would be so fun to take a loooong road trip with the entire family. I’ve never been to Vermont but it would be nice to take Mr. N sometime. He’s never been up in that part of the country. He likes romping in leaves. Lots of leaves for Mr. N~! This looks like a fantastic place! I’m always looking for great dog friendly places to stay. What a wonderful tradition this family has, it’s not often you find an endearing family tradition like this. I LOVE VT & NH. 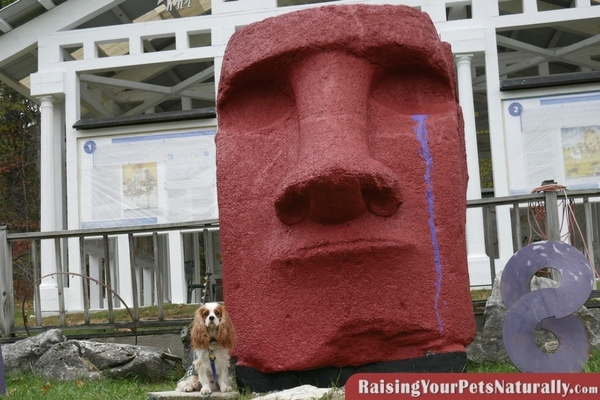 We just visited NH with our dogs & VT is on our list for a visit! Sharing! Sure thing. We were right on the edge of NH and thought about going to hit that state, but just ran out of time. The dog’s only vacation with us if we go somewhere within driving distance. Vermont is. Yay!!! Thanks for sharing this beautiful destination with us. Sure thing. This trip was a lot of fun. I only drive, so makes traveling with Dexter a-go. 🙂 It sure does. We had such a great time. I hope we can go back. This place is awesome! I would love to have my pets with me as well when I travel. And it’s good to know that there are places like this. I wish they are cat friendly too! 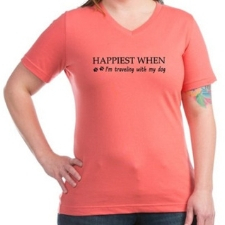 And your furbaby is just soooooo adorable! First of all Dexter is so adorable! 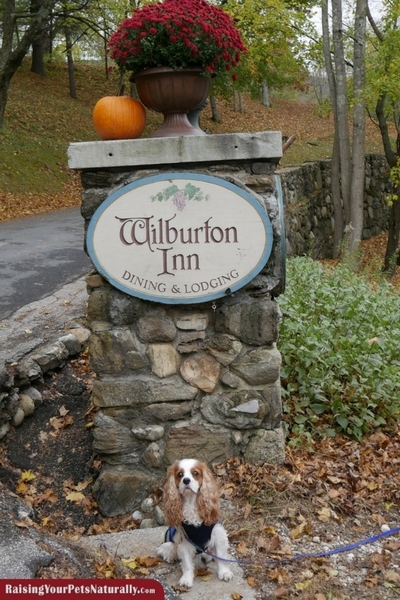 Isn’t it awesome if we can travel with our pet in a pet friendly environment like Will Burton Inn? The place is beautiful, and I’m sure you had a fabulous time staying there. Thank you. 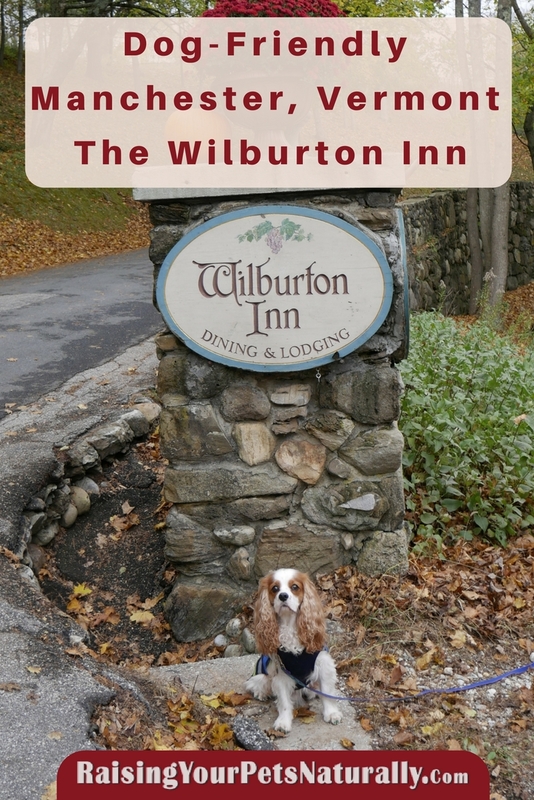 <3 Wilburton Inn is such an amazing dog-friendly place. It was so much fun walking the grounds. This surely looks like an amazing place. The fact that it is dog friendly makes it so much more better!! It was an amazing trip! I could have easily stayed another week just to walk around the grounds. your gorgeous pooch is better travelled than I. I love that you source places that a dog friendly as it cn be hard, espcially for those who travel as you all do. 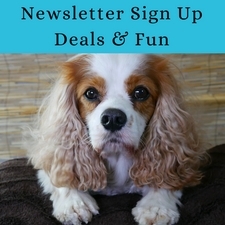 The Strawberry Inn Villa looks amazing and your dog is adorable! I can understand that traveling with pets is a herculean task but nothing is more delightful than seeing them happy! Thank you. Very true. A little planning, but so much fun!